Originally a Life Magazine image, this photo taken in May, 1962 shows Robert and John Kennedy with Marilyn Monroe when she sang Happy Birthday to the President. DEVIL IS IN THE DETAILS—It is the opinion of this blog that the unsolved murder of John F. Kennedy will be discovered someday by someone discovering the smoking gun in a labyrinth of files existing in CIA or FBI or NSC archives. The telling files on JFK’s murder will be found sometime, perhaps in a declassified much like the files the FBI recently released [December 2012] on actress Marilyn Monroe. Another scenario would be damning evidence will be uncovered in a currently hidden last will of a deceased participant in the murder. Until then, the public can only encourage the government to continue to release files that have been withheld from the public and pray that a conspirator guilty conscience will someday come to play in a last will and/or testament. What is telling about the recently released files on Monroe is how dogmatic the FBI was in trying to uncover Communist plots in the USA. Many, many files on Marilyn involve her when she was married to playwright Arthur Miller during the 1950s. But in the middle of a long roster of mundane info is a haunting file on the alleged intimate relationship between Robert F. Kennedy and the actress in 1961-62. The file appears out of context amid a litany of files on Monroe’s communist leanings and friends. Was it buried in plain sight? True or false, the file addresses the rumors of a Kennedy-Monroe relationship that had opportunities to be intimate. 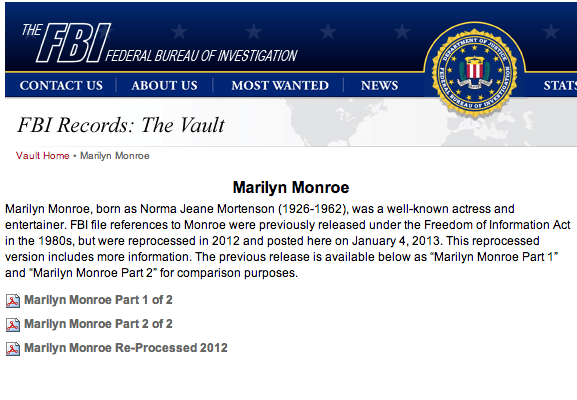 Again, it can be read by linking to http://vault.fbi.gov/Marilyn%20Monroe/marilyn-monroe-re-processed-2012/viewarchives See pages 66 to 69. What is also fascinating is the routing slip on the file as to whose eyes saw the file.